Trim removal is basically a system which is used to detect “bad boxes” during packaging and prevent gluing. This type of technology has helped manufacturers avoid major losses especially that are usually incurred after packing in damaged boxes and containers. Airtech Vacuum Incorporated has qualified engineers who tirelessly work day and night to create vacuum and pressure technologies that can be used in a wide array of applications, including the trim removal. Our high level of expertise ensures that products are packed through a superior, reliable system. There are several challenges that face manufacturers during packaging their products. The main challenge comes when they have to ensure that the final product is safely stored and transported to destinations before it reaches the target audience. At this stage, if a manufacturer is not careful about his packaging equipment, he can end up losing a lot of business due to poor packaging. The trim removal allows for easy identification of spoilt boxes and containers just before taping and gluing which stops the machine from packing into wrong boxes. The vacuum pumps and blowers involved help business owners to avoid major loses from poor packaging. Why Choose Airtech Vacuum Incorporated For Trim Removal? At Airtech Vacuum Incorporated, most clients confuse us with just being distributors. The truth is we are a full line manufacturer of a wide range of vacuum and pressure technologies. 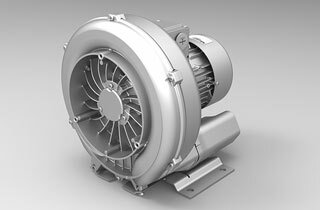 Our company was established in 1982 and over the years, we have amassed tons of experience in producing high-end products such as the regenerative blowers, vacuum pumps and more. We only hire the best engineers to provide custom engineered products to fit our clients’ applications needs. Further more, we are ISO9001-2008, UL-, CE-, RoHS-, and CSA-certified, so you can have peace of mind knowing that our products meet the specified standards for manufacturers. We have an inventory of ready to ship products for applications that do not require specialized features. However, if your application requires specialized systems, you can rest assured that our engineers will get a vacuum pump and blower system that fits your project precisely. For more information on trim removal, you can contact our representatives at any time. Be assured that all our online transactions are kept safe and secure. Browse through our inventory for the top of the line trim removal systems today and buy online.